There was a twist in this session of the Blogging Marathon. As part of the last day of this session of Blogging Marathon, I was paired with Monika. The rule was to pick up some recipe from her blog which suits my theme. Since I had chosen to cook with Cucumbers, I picked up the most suitable and most admired sandwich of all!! Since the recipe had very convenient ingredients, it was a breeze to prepare these sandwiches for my kids. I have to mention that they were gobbled up almost instantly (save for some pictures!). In a bowl, add the grated cucumber and carrot and mix well with curds/yogurt. Add in salt and pepper to taste and make sure the dip is in spreadable consistency. Spread the cucumber dip on these slices and cover it with a plain bread slice. I put the slices in a sandwich maker and they were ready in a few minutes. Alternatively these sandwiches could be grilled or made on a stove-top griddle. If you have missed any of the recipes from the 'Cucumber Mela' of the current week, here they are..
Watch out for the next week full of surprises!! 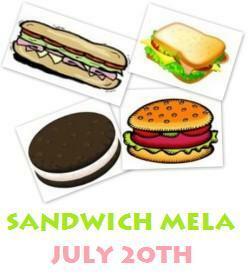 Passing on these sandwiches to Srivalli's Sandwich Mela. Delicious sandwiches dear. Please pass the plate. You are sure to see happy faces with that sandwich on the table. Happy with happy sandwitches..looks delicious. Yummy looking sanwiches, cute presentation. Delicious looking sandwich dear. may I have some :) ? Love the sandwich .. tempting me to make some. Oh wow.. awesome pics... So very inviting..
Lovely presentation, definitely a kid's friendly sandwich,delicious! I really liked the idea of yogurt dip.Will try it out. Thx for sharing. What a fun presentation ~ lovely sandwiches! Very lovely presentation Harini, loved the sandwich..thanks for sending them for the event.